Climate Change effects on reptile taxa in Chile!! Climate-Debate.com > Discussion Forum > Climate debate in general > Climate Change effects on reptile taxa in Chile!! (2) PLEASE check out the GoFundMe for this groundbreaking research being done in Chile! "Cassie's Volunteer Trip to Chile"
Chilean Volunteer Research Trip--Save the Lizards! A few months ago, I was offered the experience of a lifetime, a 10 week research internship in Chile! Working with Dr. Stanley Fox of Oklahoma State University, we will be looking at climate-induced upwards range shifts of Liolaemus (montane lizards in the Andes) species. Basically we will be ascertaining how climate change has affected the distribution of lizard populations. In the past century mean global surface temperature increased almost 1°C and by the end of this century the average surface temperature of the Earth will probably increase 1.1-6.4°C. Climate change has not only negatively affected humans across the globe, but many animals in all sorts of biomes and ecosystems. Ectotherms (cold-blooded organisms), such as lizards, have revealed the negative side-effects to climate change and are especially vulnerable. Amphibian and reptile species may gradually move to different elevations as a result of increased temperatures, often shrinking their distributions in the process (less surface area the further up a mountain you go). The topmost species are even more vulnerable, as they have "nowhere to go." This scenario has already been happeing with lizards in Mexico, and modeled for other species throughout the world, including South America. With the increase of global temperatures, extinction rates are expected to rapidly increase. Chile is home to about 130 species of lizards, which mainly inhabit the mountainous regions of the Andes. To date it is unknown if global warming has affected the lizard fauna in Central Chile as it has in the Northern Hemisphere, making it a perfect place to conduct this type of research as it is an extremely mountainous country with an impressive diversity of lizards. The goal of this reserach is to pinpoint what species (at what locations) are shifting their elevations upward as a result of rapid increasing ambient temperatures. These results should apply to other lizard species facing similar conditions thorughout the Andes and other temperate ecosystems. In the past century mean global surface temperature increased almost 1°C and by the end of this century the average surface temperature of the Earth will probably increase 1.1-6.4°C. The sun's magnetic field is weakening and solar output is decreasing. Temperatures will be inching downward for another twenty years at least. crotophytus wrote: Climate change has not only negatively affected humans across the globe, but many animals in all sorts of biomes and ecosystems. No one can identify this "climate change" thing. If I point to something there's no way say if it's "climate change" or "not climate change." (2) No one can identify this "climate change" thing. If I point to something there's no way say if it's "climate change" or "not climate change." That's awesome! A graph! I bet you got it off the internet, which means it's true, accurate, meaningful...all that. This is a totally unsupported claim. 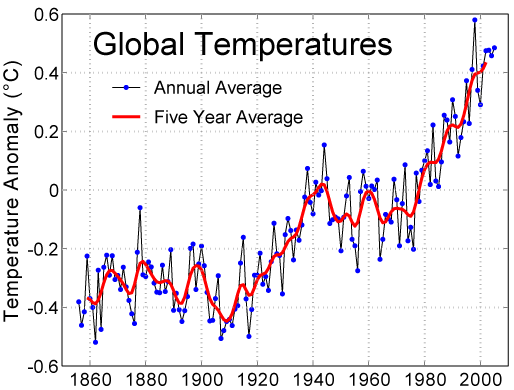 There is no science which supports this(+6.4c) what so ever. Thus the man is lying. Humanity still cannot measure the average global atmospheric temperature to an accuracy anywhere near that, much less make such a determination for any point in the history of the planet. Any claims involving earth's average global atmospheric temperature, whether they be claims of absolute temperature or claims of temperature change, are obviously lies. Now the only questions that need be asked are 1) why people still believe they can accurately ascertain the average global atmospheric temperature and 2) why they believe that atmospheric composition is a factor when science says otherwise. 1) Because the propagandists keep telling them so. 2) Because the propagandists keep telling them so.